A designer’s guide to creating your first WordPress theme. Creating your first theme is a big deal. 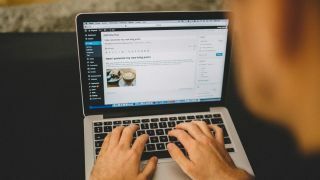 You might know how to turn a functional site into a thing of beauty, but building a WordPress theme means acquiring a new set of skills to make it function the way you want it to. Here are some top tips for designers looking to build their first WordPress theme. You'll learn what makes a good theme, some of the tools you should be thinking about and what you need to know about coding. Not ready to build a WordPress theme yet, or looking for something different? Take a look at our roundup of great WordPress tutorials to pick up some more skills. Before you begin building your first WordPress theme, you need to have an idea of what works and what doesn’t. This is the inspiration stage. Now, that doesn't mean stealing other people’s work. What it means is researching into what different themes look like, how they function, and how they are put together, taking that idea, and turning it into something different. It’s all about the execution. Take a look at these WordPress portfolio themes for some inspiration. When it comes to building a WordPress theme, you should have the end goal in mind at all times. What do you want your site to do? Do you want to create a theme to sell products? Or maybe improve brand awareness? Or build a blogging platform? Or drive lead generation? Decide on the purpose of your theme, and keep it focused – don’t dilute things by choosing too many different aims. You’ve got your goals in mind and the foundations for a strong theme are laid, so now you need to decide whether you are going to build your WordPress theme from scratch or customise an existing template. Starting with an existing template and adding your own customisation is an easy way to start. Take a look at our roundup of great free WordPress themes if you want to go down this route. Using an existing theme framework means you’ll get access to a lot of functionality and structure (which could be key if you don’t want to spend hours learning basic coding). However, you won’t have the same level of customisation you’d get if you were building a WordPress theme from scratch. To build from scratch, you need to be prepared to put in the time to learn code. If you do decide to go down this route, embrace Stack Overflow and the WordPress Codex to help you build and customise your theme. The WordPress Codex serves as an incredibly useful online manual from the developers of WordPress. It’s a huge resource bank of information on every template, function, plugin and feature you can think of, including tutorials on how to use and develop WordPress sites and themes. Stack Overflow, on the other hand, is an unofficial but trusted online community for developers to learn and share programming knowledge. Both are very useful. WordPress also has a helpful tutorial on how to develop a WordPress theme from scratch. You want your website to look the best it can and perform to a high standard. This means you need images that will catch the eye. The good news is tools like Design Wizard are readily available and easy to use to help you create stunning images. Design Wizard actually has thousands of pre-made templates to suit every need. Other tools, such as Pikwizard, PixelDropr and IcoMoon allow you to gather free stock images, create buttons, icons and fonts. Check this out for more essential web design tools. Just keep in mind, everything you want to build should be done in the WordPress wp-content folder – you don’t want to be messing around with core code! There are lots of folders within WordPress, each of which are responsible for different functionalities. A word of caution before you make the decision to build from scratch or not – it’s fairly easy to end up building a theme that looks nice, but doesn’t work. So be careful to ensure you don’t end up with a theme that doesn’t actually function and requires hours of effort to improve the coding.